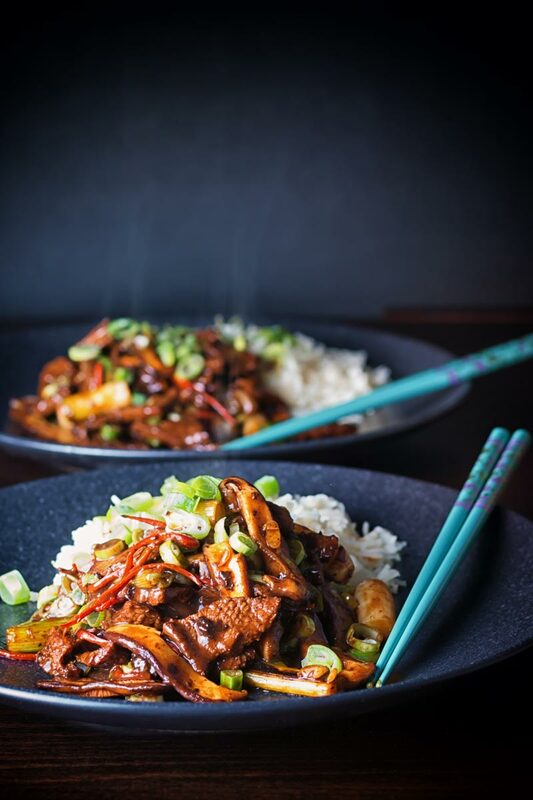 This Beef Stir Fry with Shiitake Mushrooms is so quick and simple to make, who needs to wait for the delivery guy when this is quicker, cheaper and tastes glorious! 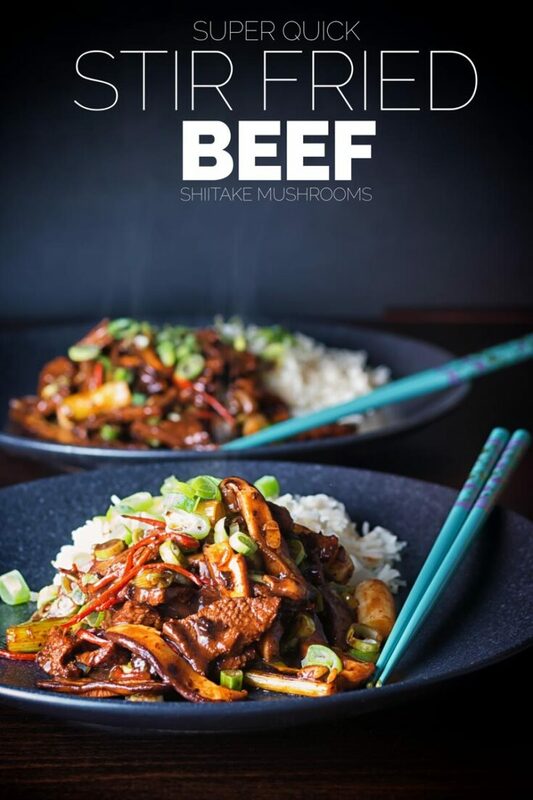 Beef Stir Fry with Shiitake Mushrooms. It would seem that one of our local stores has come across a supply of Shiitake Mushrooms and I am not one to look a gift horse in the mouth. So here I am with another Chinese inspired fakeaway recipe, a beef stir fry with shiitake mushrooms and chili. It is fabulous to have these mushrooms available at the moment and I am cooking with them a lot. Although my hot and sour soup is the only one that has appeared here, so far. 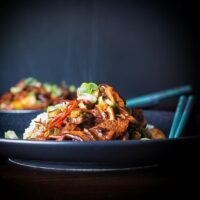 This Stir Fry Beef is incredibly quick, sure I have 20 minutes on the recipe but I reckon I could have this down in 15 minutes if I was pushed! 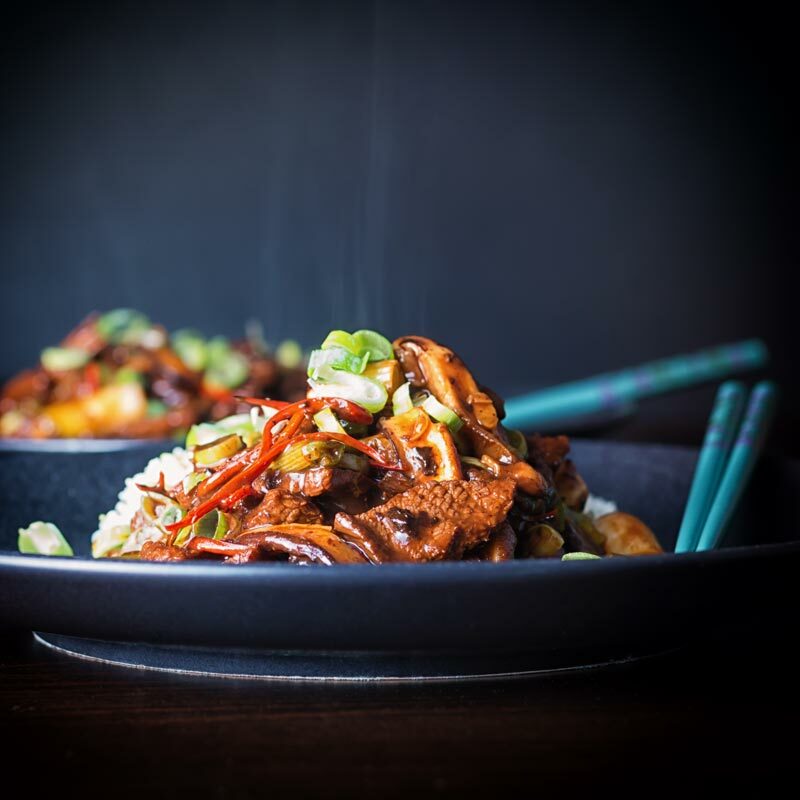 In short, this Beef stir fry recipe is quicker, cheaper and tastes every bit as good as your local takeaway! What Beef to Use in a Beef Stir Fry? When it comes to beef you want something that is already pretty tender. We do marinade the beef with cornflour and soy which helps a little. But that is not enough to break down a tough cut of meat. I use Sirloin Steak it is something that can cook quickly and remain tender! You could also use something like flank, skirt or hangar steak. A great tip for getting super tender beef is hidden in the preparation of the beef as well as the cooking. You want to cut your beef against the grain. Essentially you cut perpendicular to the way that the muscle fibres run. By doing this you are shortening those fibres, this means you do not need to do that with chewing. Ergo, beef that feels more tender! You could flip this around and make it with chicken but you would need to cook it a little longer. Not much though, just a couple of extra minutes with the chicken in the pan over the beef so still super quick. Shiitake mushrooms have been around since the 13th Century in Chinese food and I love them. Whilst their flavour is relatively mild they do act as a flavour sponge for other flavours. You can even get them dried which is what I use in this beef noodle soup! They also have the most incredible texture, they are particularly firm and almost meaty in texture. All of this means they sit perfectly alongside the beef in this recipe. You could also increase the mushroom levels in this recipe and reduce the beef without impacting the flavour too much. This means a Beef stir fry that is just as tasty but a bit cheaper too! You can also play with different mushrooms. I have made this with oyster mushrooms, chestnut, regular mushrooms and portobello mushrooms. It just works! 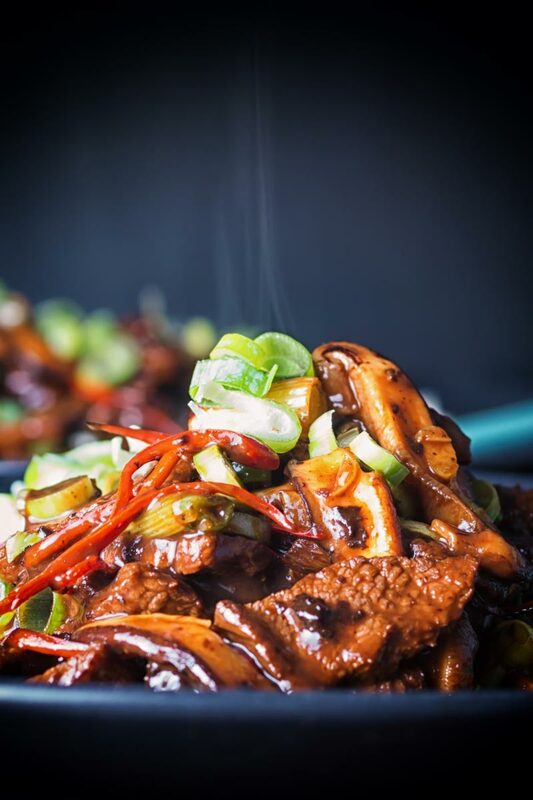 This Beef Stir Fry with Shiitake Mushrooms is so quick and simple to make, who needs to wait for the delivery guy and this is quicker, cheaper and tastes glorious! Slice the steak into thin strips maybe 3-4mm wide across the grain of the beef. Cut the white part of the spring onions into 1cm lengths and finely slice the green parts, then finely slice the garlic. Deseed and finely slice the chilies length ways, don't go too hot with these, the heat should be subtle in this dish. Remove the stalks from the mushrooms and finely slice the caps, we are only using the caps here, freeze the stalks for another use. Combine the soy sauces with the cornflour (cornstarch in the US) and add the sliced beef and allow to marinade for 10 minutes. Combine the Hoisin sauce, Shaoxing wine and sesame oil in a bowl and set aside. Heat half of the cooking oil in a wok over a high heat and just as it begins to smoke and stir fry the shiitake mushrooms and white parts of the spring onions for 2 minutes and then remove and set aside. Now add in the remaining oil and add in the chili strands and garlic and fry for 30 seconds before throwing in the beef with marinade and stir fry for a couple of minutes. Now return the spring onion and mushroom mix to the wok and add the Hoisin mix and cook for 30 seconds or until the sauce bubbles. Finally garnish with the green parts of the spring onions. 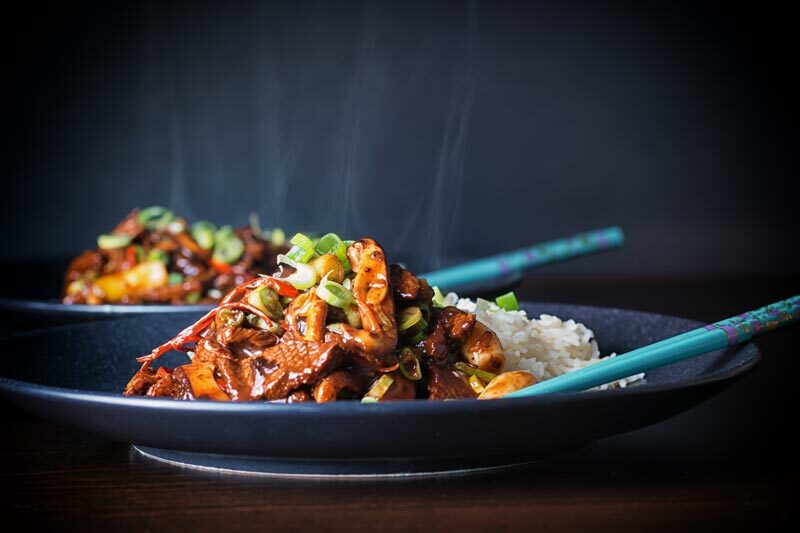 Serve with some simply boiled jasmine rice, again with all stir fry dishes get all of your ingredients ready before you begin. I cooked this tonight and my husband and I loved it. Thanks a lot, Brian! That looks so delicious and flavorful! My husband is a big fan of mushrooms and would love to try out this dish for him. Thanks Priya, hope he enjoys it. Oh my goodness this looks good! I just happen to have all the ingredients on hand too – I’ll be making this soon! I like it when that happens 😀 Enjoy! This stir fry looks so colorful and tempting! Beef and mushrooms is such a delicious combination! Would definitely try this recipe soon! This looks like a brilliant quick midweek meal but so full of flavour too. I really need to look out for some shiitake mushrooms next time I’m shopping. This looks and sounds delicious! I could dive right into my screen!! Gorgeous photos! Anything with beef and mushrooms is a winner as far as I’m concerned. Thanks for sharing.! Me too a perfect combination and so versatile, whether old school European or full on Asian it just kinda works! Love the earthiness these mushrooms bring to the dish. Perfect combination of flavours. Nice for a weeknight dinner. Makes the perfect leftovers too. This looks wonderful! Shitake mushrooms are great for adding meatiness to a dish. I’ve never eaten Shiitake mushrooms :O I can never see them in my local stories! And seriously – who WOULD order takeout when you can make something like this beautiful looking dish?? I am quite surprised one of our local store has been stocking them, not exactly your traditional Hungarian ingredient… However I have been making this disg for years with chestnut mushrooms and it still works exceptionally well. Why would anyone order takeout when you can make something as delicious as this? It looks delicious and I wish I could eat it through the screen. I reckon I would still order take out on a lazy movie night if the nearest takeaway place wasn’t 100km away 😮 But you are right it would definitely be a rarity!